Sembcorp Industries shares shot up yesterday amid speculation that it was about to spin off a unit in India. Its offshore and marine arm, Sembcorp Marine, also had a positive day following an upgrade to a "buy" rating by Nomura. 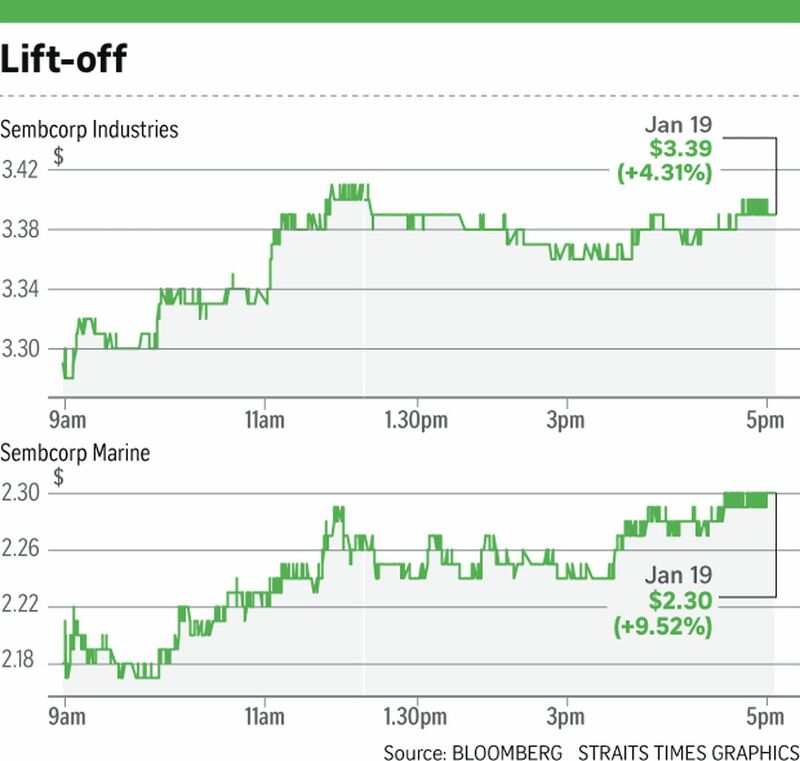 Sembcorp Industries added 14 cents to close at $3.39 on trade of 14.9 million, while SembMarine jumped 20 cents to $2.30 with 43.1 million shares changing hands. The activity prompted Sembcorp Industries to issue a clarification on reports of rumoured initial public offering (IPO) plans for a unit in India. It told the Singapore Exchange: "At present, there are no developments warranting an announcement but in the event of any, the company would update the market as necessary." A media report from India on Thursday suggested that Sembcorp Industries was preparing to file an IPO for Sembcorp India that would raise about US$500 (S$660 million) to US$600 million. Meanwhile, Nomura analysts Abhishek Nigam and Bineet Banka upgraded SembMarine to a "buy" yesterday with a target price of $2.70. They pointed to its improving gearing, a pickup in orders and a likely rise in free cash flow with its capital expenditure cycle coming to an end. "2017 witnessed a modest pickup in offshore and marine orders. In fiscal 2018, should Brent oil prices sustain above US$60 per barrel, we expect new orders to rise further." OCBC Investment Research analyst Low Pei Han said: "Sembcorp Marine, being a pure play, is in good stead to benefit from the oil price recovery." She also cited speculation on the privatisation or divestment of SembMarine by Sembcorp Industries as another potential reason for the run-up in their share prices.